(Nanowerk News) Wettability — the degree to which a liquid either spreads out over a surface or forms into droplets — is crucial to a wide variety of processes. It influences, for example, how easily a car’s windshield fogs up, and also affects the functioning of advanced batteries and fuel-cell systems. Until now, the only way to quantify this important characteristic of a material’s surface has been to measure the shapes of the droplets that form on it, and this method has very limited resolution. But a team of MIT researchers has found a way to obtain images that improves the resolution of such measurements by a factor of 10,000 or more, allowing for unprecedented precision in determining the details of the interactions between liquids and solid surfaces. In addition, the new method can be used to study curved, textured or complex solid surfaces, something that could not be done previously. “This is something that was unthinkable before,” says Francesco Stellacci, the Paul M. Cook Career Development Associate Professor of Materials Science and Engineering at MIT, leader of the team that developed the new method. “It allows us to make a map of the wetting,” that is, a detailed view of exactly how the liquid interacts with the surface down to the level of individual molecules or atoms, as opposed to just the average interaction of the whole droplet. The new method is described in a paper appearing on April 25 in the journal Nature Nanotechnology. The lead author is postdoctoral fellow Kislon Voïtchovsky, and the paper is coauthored by Stellacci and others at MIT, in England, and in Italy. Stellacci explains that the ability to get such detailed images is important for the study of such processes as catalysis, corrosion and the internal functioning of batteries and fuel cells, and many biological processes such as interactions between proteins. 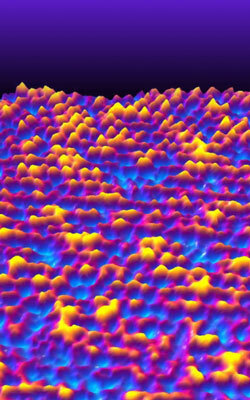 The method, developed with support from the Swiss National Science Foundation and the Packard Foundation, works by changing the programming that controls an Atomic Force Microscope (AFM). This device uses a sharp point mounted on a vibrating cantilever, which scans the surface of a sample and reacts to topology and the properties of the sample to provide highly detailed images. Stellacci and his team have varied a key imaging parameter: They cause the point to vibrate only a few nanometers (as opposed to tens to hundred of nanometers, which is typical). “By doing so, you actually improve the resolution of the AFM,” Stellacci explains. The resulting resolution, fine enough to map the positions of individual atoms or molecules, is “unmatched before with commercial instruments,” he says. Such resolution had been achievable before with very expensive specialized AFMs, of which only a few exist in the world, but can now be equaled by the much more common commercial models, of which there are thousands. Stellacci and his colleagues think the improved resolution results from the way the vibrating tip causes the water to repeatedly push against the surface and dissipate its energy there, but this explanation remains to be tested and confirmed by other researchers. With their demonstration of both a 10,000-fold improvement in resolution for the specific function of measuring the wetting of surfaces and a 20-fold improvement in overall resolution of the lower-cost AFM, Stellacci says it’s not clear which of these applications will end up having more impact.